This post has been in my head for almost a year but with one thing and another it just didn't happen. 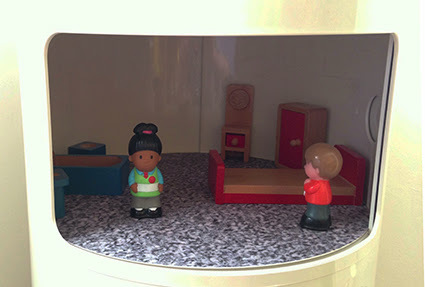 But now in the run-up to Christmas it seems like a great time to talk about dolls houses. I'm sure Santa will have been asked for one or two already! 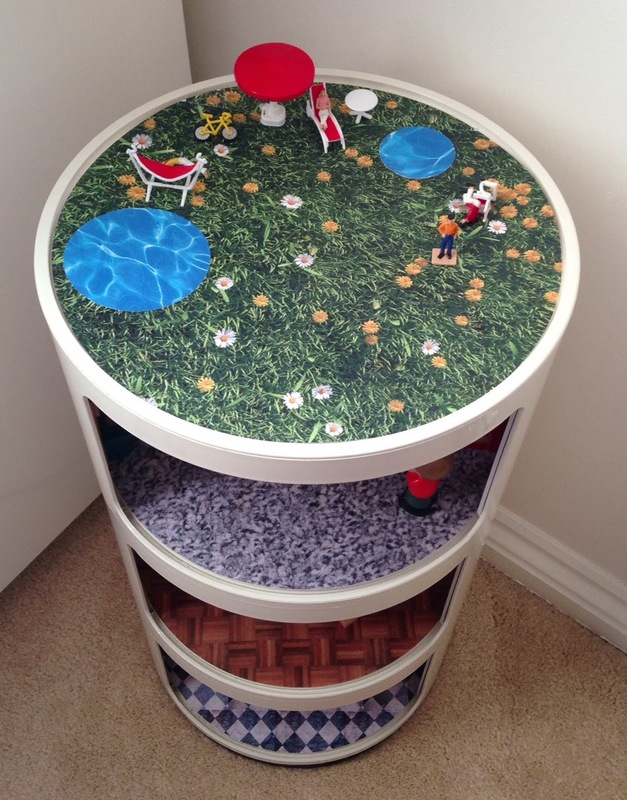 I loved my dolls house when I was little; I 'wallpapered' the inside with football stickers but I played with it for years. And now with my job as a modelmaker, I get to build little houses all the time! Maybe because of this, and maybe because I cannot stand all the expensive, very pink dolls houses that seem to be everywhere, I started to think slightly differently when choosing one for our son Wiss. There are some truly amazing ones on Pinterest (of course!) My board This is Dolls House Heaven has lots of inspiration to get started with. I really like the ones that have been made out of other things - boxes piled up together to make tower blocks, or houses in bookcases or sideboards. And I love that they are not gendered - a house is a house, and can be enjoyed by both boys and girls. Simple. 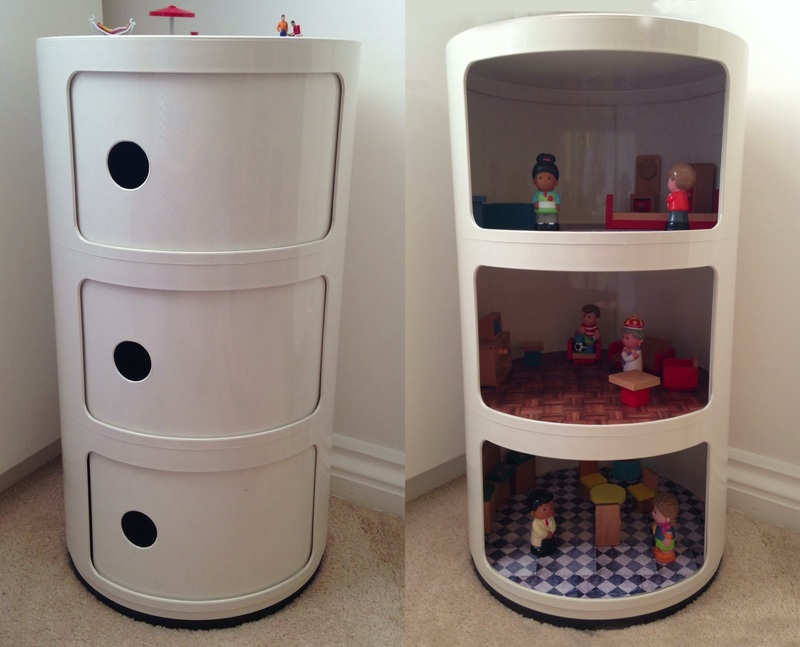 I bought a Componibili storage unit when we bought our first home. I persuaded my husband that the expensive price tag was worth it because it's a 'design classic'. Stylish and retro yet modern - I soon came to find out that it is actually completely useless too! It is impossible to put anything at the back of the compartments as you can't get to them from the front. Aargh! But it looks so damn cool though. It found it's way into Wiss's room when we moved house and he started to play with it. Genius! It makes a brilliant 3 storey dolls house with a roof garden too. I printed out images of flooring I found on the internet - tiles, carpet and parquet - and some grass and water to make the garden. I glued them on to card and then stuck them place to make the kitchen, lounge and bedroom/bathroom. 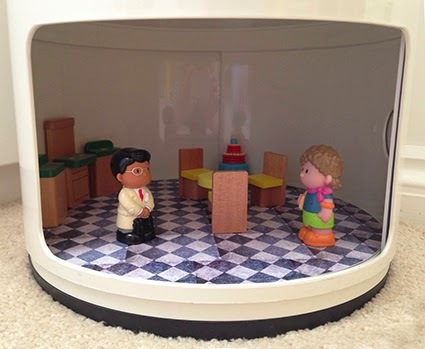 We already had lots of Happyland people, and I bought the wooden furniture on eBay. 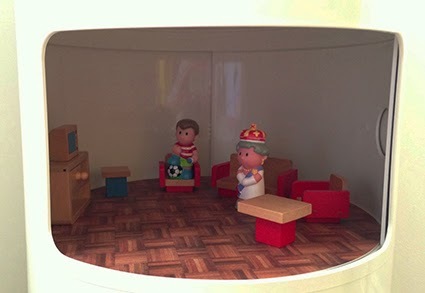 I love the way that Wiss involves lots of different toys when he plays; we often have the Brio train taking people from their dolls house to work and back, and even Lightening McQueen has popped in for a cup of tea and some cake. You can see some tiny figures that have made themselves comfortable on the roof terrace - scale is not important round here! If you want even more inspiration then why not ask an architect to design one for you? I'm not sure that all the houses would be popular with kids but there's definitely some interesting ideas in this article from the Guardian. As always, I'd love to see what you (or even your kids) have made. Where do the dolls in your life live? You can leave me a comment below or tweet me your pictures @thisiswiss. I Found My Knitting Mojo Again!